I made some reference in my last posting to the 5 types of Russian folk costume, and I thought that I would do a quick summary to introduce them. I should do the same for the 5 types of Ukrainian Costume. That will be forthcoming. These refer stictly to the women's costume. The men's costume does vary, but not a whole lot. Shirt, usually with opening on the side, usually on the left, pants, narrow sash, boots or footcloths with lapty, Overcoat. I have seen this term translated as 'jumper', which works for Americans, but not for the British, also as 'sundress', which is rediculous, it is better to just use the Russian term Sarafan. This garment is basically a long skirt, worn just below the arms with straps over the shoulders. A Chemise is worn underneath, the collar area and sleeves showing. It may be belted or not. Here is a drawing by Max Tilke showing three ways to wear what might be called the 'aristocratic' version, although this was worn by peasants. 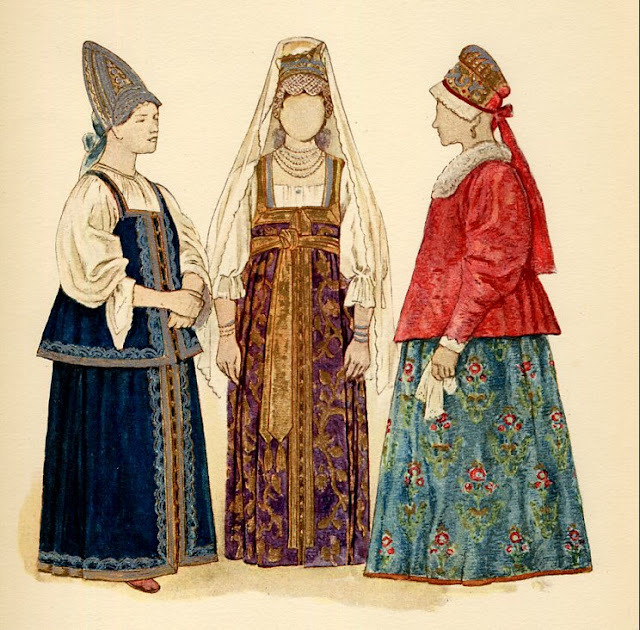 The woman in the middle is wearing the Sarafan by itself, with a Chemise, the one on the left is wearing it with a vest, cut basically the same as the Sarafan but shorter, and the woman on the right is wearing it with a jacket. This type of Sarafan is called 'kosoklyny', which means 'angle-cut', and was made from rich bought material, velvet, brocade, damask, etc. Often decorated with ribbons, galloons and metal lace. Max also gives us the cut, the side seams are at a 45 degree angle. 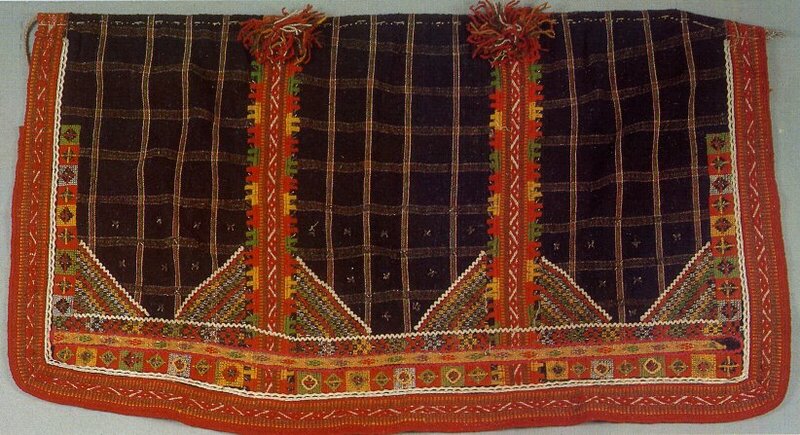 narrowed into a top band with pleats or gathers, of locally produced or home woven cloth. There is quite a variety of detail in these outfits, and the accessories vary quite a bit. Here is one example from the village of Zhemkova, county Syzran, Province Symbirsk, made of hand printed calico. You can see the gathers at the top. Here is a back view of another example from the ﻿Province of Vologda, Solvychegod county. This one is made of home woven cloth in a small plaid. You will see the pleats sewn down along the top edge. The chemise is made of cloth with woven in ornamentation. Here is the cut and layout of this type of Sarafan. There are variations on both of these types of cut. So the Sarafan can be very rich looking or very homemade looking. Each has its own beauty. 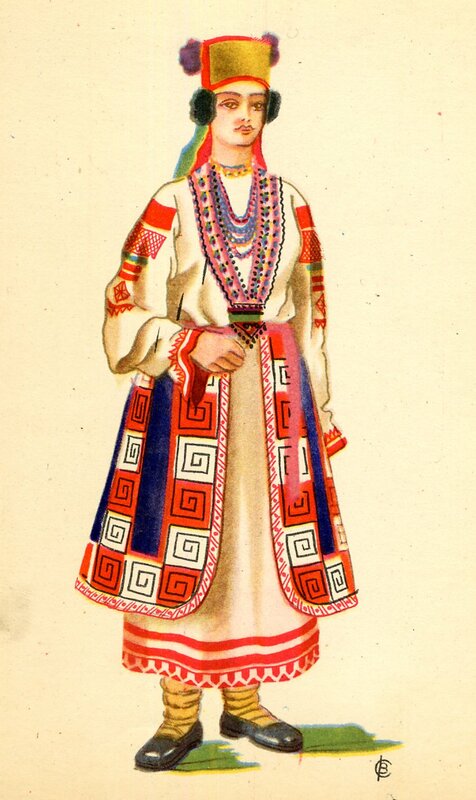 This is the primary costume form to be found in North Russia, although it has also made inroads into the South. The dividing line between North and South is about the level of Moscow. In Russian, this is spelled poneva but pronounced paniova. See my posting on Kaluga costume for more information. 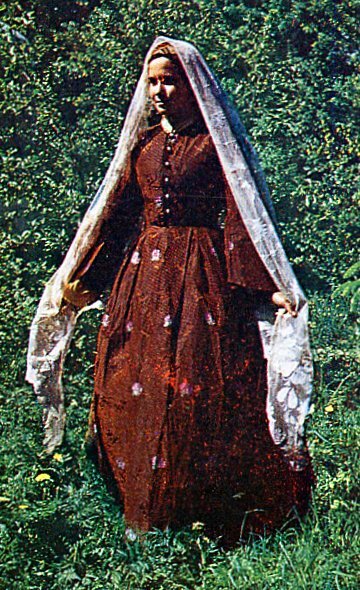 The Paniova is typical of South Russia, and is older than the Sarafan. It consists of three loom widths of a checked material sewn side by side and then rolled into a waistband, and tied around the waist over the chemise. Here is an example of one from Orlov Province. This is often considered to be the Russian equivalent of the Ukrainian Plakhta. The Paniova is usually woven in black or dark blue, with white lines forming a checkerboard. As in this case, it is often ornamented with embroidery, ribbons, woven strips, galloons, etc. in a way distinctive to each region. Originally it was worn open in front, like in this postcard showing a costume from Orlov. In some regions a fourth panel of a different material was added, to make the Paniova into a closed skirt. Here is one example from Tambov Province, Spas County, village of Dubrava. You will note that this Paniova is very lightly ornamented. 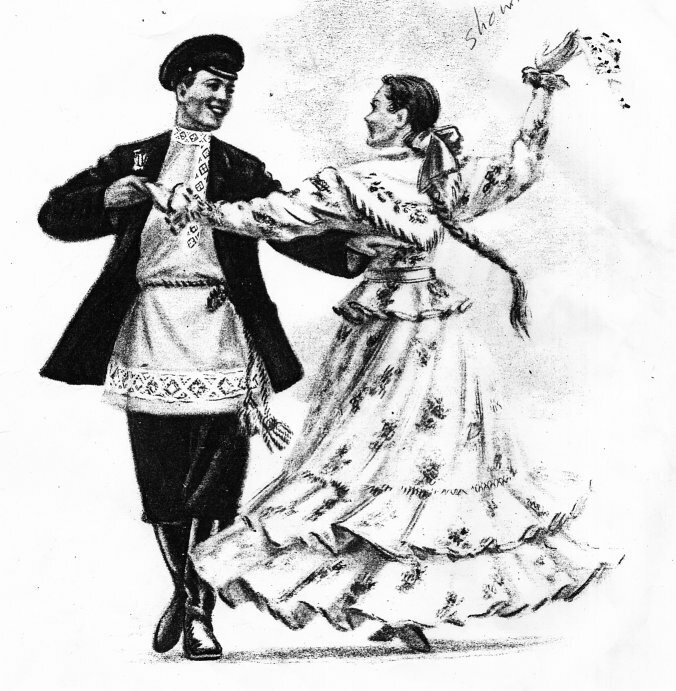 The chemise shows the triangular yoke insets which are typical for some areas of South Russia, as opposed the the rectangular insets we see in most Slavic Nations. These two, the Paniova and the Sarafan are by far the most widespread types of Costume. The Andarak is an actual skirt, usually of wool with woven stripes. This term is also found in northern Ukraine, to refer to similar types of skirts. This costume is uncommon, and is connected with the 'Odnodvortsi', a group of people who may be descended from colonists, merchants or mercenaries from the Lithuanian Empire, which at the time included Ukraine and Belarus. I admit to not being very clear on the identity of the Odnodvortsi. 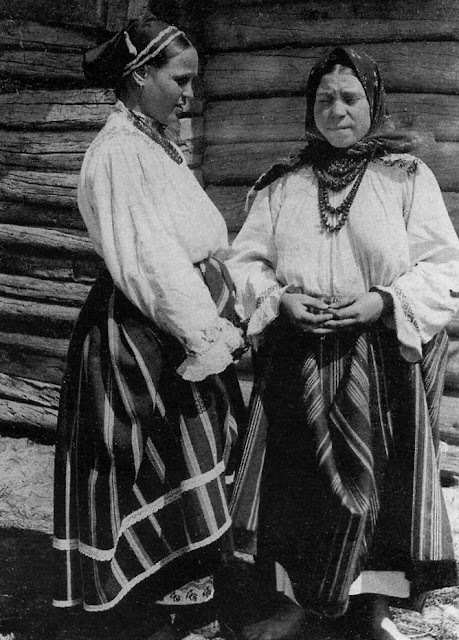 Here is a photograph of two women of the Odnodvortsi, taken in 1908 in Voronezh Province. You will notice the hem of thc chemise showing under the Andarak. Here is a festive costume from Tula Province. 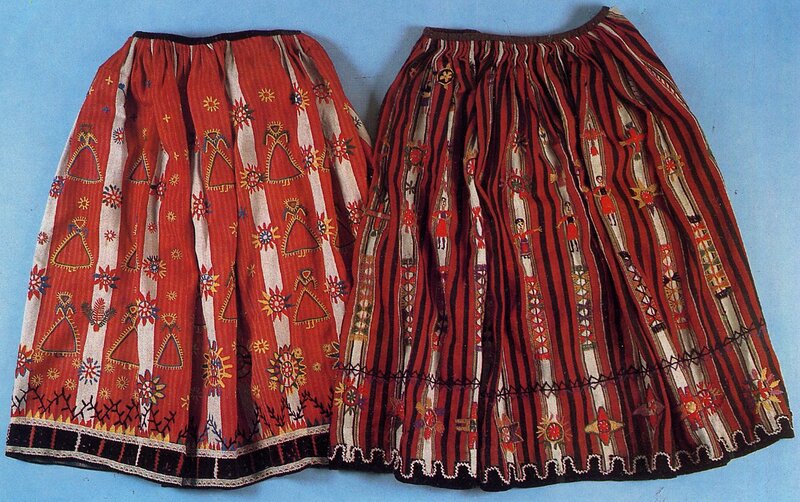 In Tambov Province, the Andarak was often embroidered right over the stripes.Here are two examples. This costume was only worn in scattered locations in parts of South Russia. 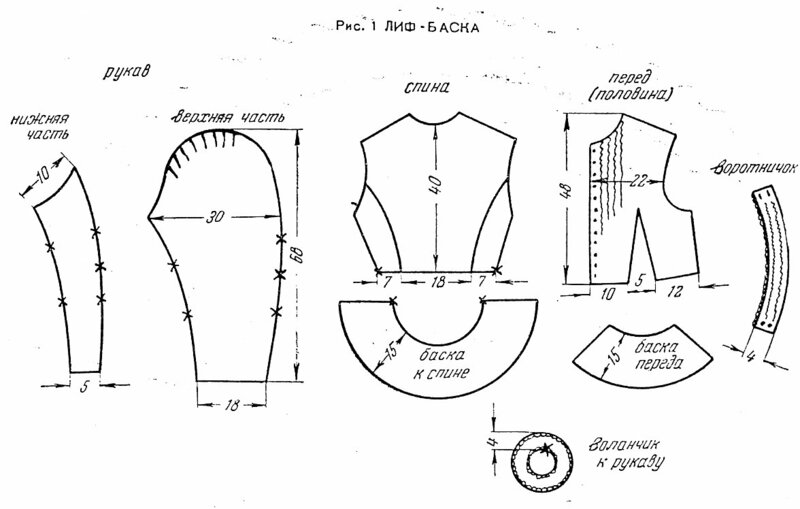 This is an actual dress, with sleeves integral to the construction of the garment. This is rarely found, only in the far south in the Don region. It is clearly derived from the Costumes of the Caucuses. Here are two of the very few images I have ever been able to find of this type of costume. This type is from a much later period than the others, being basically an 19th century creation. It may be considered more a period costume than a folk costume, but it is widely used by performing groups, especially those from regions further east, in Siberia and other places which were colonized by Russians relatively recently. It consists of a skirt and jacket with a peplum sewn from factory made cloth, and to American eyes looks very much like Pioneer Costume. ﻿Here is a drawing of this type of costume. This one is quite a bit longer than usual. It is more common to see the hem at the level of the second flounce. Here is a photograph of a version of this type of costume from Arkhangelsk Province. 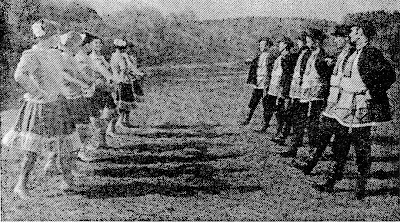 Here is a photograph of a Quadrille being perfomed in Astrakhan Province. For those who might be interested, here is a schematic of the bodice/jacket, in Russian called Lif-baska. Thank you all for reading. 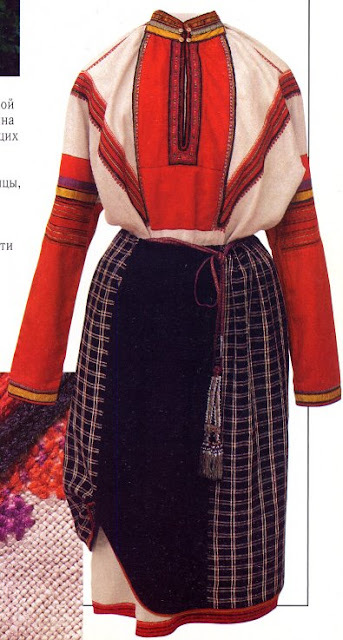 This is only a very basic overview of Russian Folk Costume. I will be posting more detailed examinations of local costumes in the future. I hope that this was interesting and informative. As always, please feel free to contact me with research requests, or commissions to design or make or embroider costumes or other items for a group or individual. I can't believe there are no posts to this! It was very interesting. 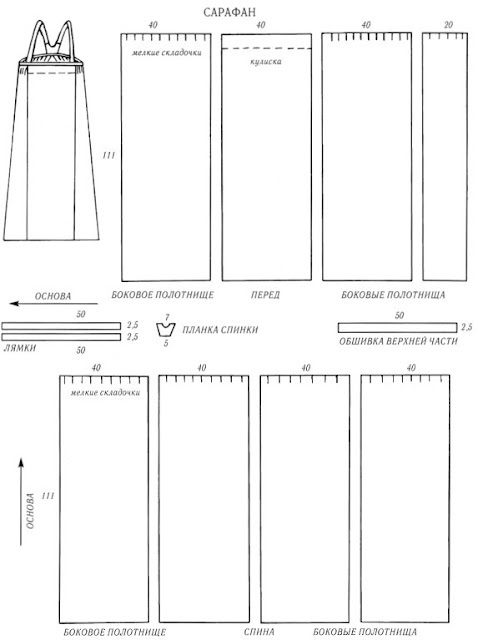 I am looking to buy or have someone make me a traditional dress from the Tambov region of Russia. Would you be interested? Or know someone who would be able to make something from the Imperial Era, 1914? does anyone know where i can buy a dress like the red one? depending on the kind of plaid cloth that I can find. Making the chemise would be more difficult, but only because finding cloth with such a design woven in would be hard. contact me if you would like to order one. Fantastic and informative blog! This will be of great help as I am trying to make a Sarafan in UK. Hi, just wanted to say that I loved the article - just would of liked to know what would work with the top 2 sarafani in your blog as a head piece? I was born in Astrakhan and spend all my school years in Tomsk,now sing traditional Russian Music in Western Australia, Perth. I never knew the type of costume that would be typical for where I was born or where I spent all my childhood. Now the other girl in my group came from Khabarovk with a beautiful costume :) I am trying to find something that could be vagely compatible, been checking the net for traditional costumes. Could you please advice if you know the style which could be representing Astrakhan or Tomsk and I would of wanted to know if there is someone who is making the costumes of that kind.I would love to be able to sing in a great costume - it would of meant a world to me. Both Astrakhan and Tomsk were originally built by Tatars and have been settled by Russians relatively recently. The Sarafan started in the area around the Finnish border, and spread over most of Russia from there. So I would say pick a style which you like. Irina may have more specific information about those areas. you may write to her. this company has commercially available costumes. They have rather simple kokoshniks of the type which would have been worn by single girls. their blouses are nice, with sleeves covered with ribbons, but their sarafans are too narrow. I wish that they would sell ribbon. Sarafans are not difficult to make. The ornamentation takes more time. You can write me directly at rkozakand@aol.com I would be glad to work with you in making a sarafan and other costume parts, esp if you know someone who has sewing experience, and if you find material which you like. Their outfit is not bad, but as I said, the angle of the cut is too narrow, as they are trying to save money. I have two friends who have them, and the tall one does ok, but the short one can hardly walk in it. You might get the headpiece and blouse, but make the sarafan itself. I could certainly make it, but then I would have to ship it. Actually fitting it is not hard, as it is very full. Matching the color might be more challenging. If you get the blouse, I would add to the bottom so as to make the chemise. Or I could make the chemise as well. The only thing is that they have nicer ribbon than I have access to. I have access to print material which would work well, but I am not sure what kind of finish you had in mind for the material. The sarafan is beautiful, I'd like to make something like it for maternity wear. Unless you sew, I doubt anyone has maternity wear, but as wide as the skirts are on a sarafan, it might work anyhow. I saw an ad for a sarafan from therussianclothingshop.com just yesterday, you might want to go look what they've got. Oops, my memory--that was therussianshop.com. There's also an outfit called rusclothing that seems to have a lot of ethnic wear. And of course there's always ebay, and Etsy. That is what i said, jumper is not a good term. i did not say that the British used the term sundress, but that i have seen that in translations, and thatt the term is not useful. Thank you for this! I was looking for info as I delve into designing costumes for the Russian variation in the Nutcracker. This gives me a lot to go on, so we don't end up with a German looking costume! I want to create a complete russian costume for a 50 year old widowed womn with children. I know that the color, embroidery, and stly of dress vary with the womans station and i want to make sure i get these correct before iI go further. You have any idea of where I can look? I am making a collection of ethnic folk costumes for 18" dolls. I have some beautiful material for the sarafan, but I'm hoping to find a pattern for a jacket to go over it. I saw a picture of a short, fur-lined (?) jacket with very deep pleats across the lower back. Does this type of jacket have a name? And where could I find a diagram or pattern? I could draft a simplified pattern to fit the doll. Thank you so much! My Russian ancestry is Russian/Finnish and Adyghe/Druze. 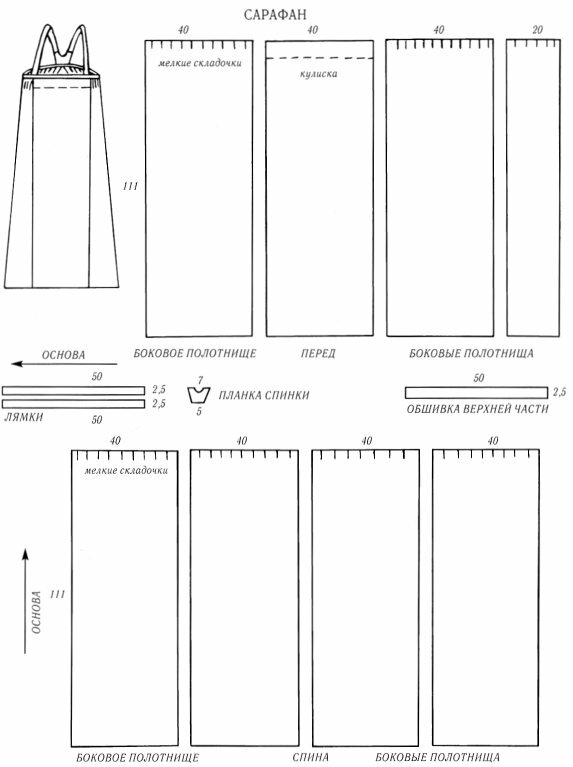 The Russian/Finnish costume would be the Sarafan, and the Adyghe costume would be the Kubelyek. Is that right? I would like to make both if that is right. Yes, sort of. You have to remember that Russia has always been a multiethnic empire. This article only talks about the costumes of ethnic Russians. Neither the Finns nor the Adyghe are ethnically Russian. The Finns either refers to the period when Russia occupied Finland, or to the region of Karelia, which is still part of Russia. They do indeed wear the sarafan, and were likely the inventors of it. The Adyghe are one of the tribes which are most commonly known as the Circassians. The Kubelyek is certainly deived from a Circassian type costume, so that would work. Seamstress for a ballet school in New Zealand here - thank you thank you thank you for your amazing blog, I have been looking for authentic information of this sort for a long long time. This will definitely be taken into account the next time one of my girls needs a Russian National Dance costume. Specifically thanks for pattern and embroidery details in your posts, very much appreciated as often hard to find when one doesn't speak the language fluently. I would love to make this dress/sarafan for my daughters and myself as everyday dresses.I cannot find any pattern in English to assist me in making this.Can you point me in the right direction? 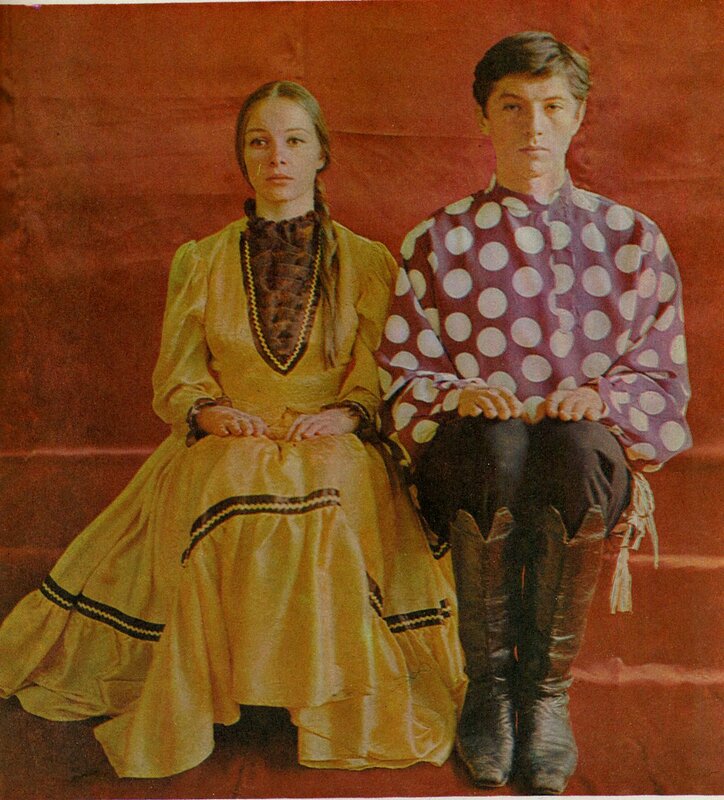 I am falling in love with the Slavic/Russian clothing.Thank you for your post here.Well done! !